Every single thing you love about Ralph and Vanellope is stronger, poignant, funnier and more humane. Their relationship is much stronger than ever and seeing them grow as people and friends is a joy. The two Ralph movies are their own. The first one is a classic and more simpler with a strong story. The second is much much more character driven than story driven, but is packed with more emotion and a bigger bigger world, however it’s much more dated, but the references come and go and most of them aren’t even bad. You can’t go wrong with either movie. I know you guys hate or are worried about the Princess scene. All I can say is the elements you are worried about are completely or mostly fixed. You will like it much more than you think. And their final scene is not only hiliarious, but a show stealer. I really want to talk about the song. I can say that I really really liked it, but it wasn’t what I expected in some parts. I’ll talk about it when the song is released next Friday. I think it’ll take me a couple of listens before I get used to it. Also, don’t snicker at the Part of Your World/ Someday My Prince will Come comparisons. Either way, I’m so glad the song happend! The new characters are excellent and memorable. Not one weak link. You guys will like them. That’s all I can say for now about the film. I think a lot of you will like it if you like the first movie and Ralph/Vanellope. I had a blast seeing them again and I hope there are more of them in the future. And stay throughout the credits. (If someone at WDAS sees this and thinks I’m saying too much, feel free to hit me up! I only mentioned the song because it’s known in this board). Thanks for sharing your impressions! You've eased my concerns about certain elements I was apprehensive about. Did you get a chance to listen at the pop version of the song in the end credits? What did you think and how would you compare it to the movie version? And glad you felt the same as I did when I saw it one month ago. So frustrating that we can't talk about it. Wow, that’s incredible, disneyprincess11! I'm so envious! But I’m really happy for you, of course, and I’m glad you liked it. Thanks for sharing your impressions! But tell us, aside from the movie, what was the experience like? Was it your first time at the studios? Did you get to meet any Disney artists? Did they give some behind-the-scenes info? Sorry for so many questions , you don’t need to answer them if you don’t want or are not allowed to. That’s a relief. I’m still not sure I will like it, but I’m glad some things have been fixed. And how do you know the song will be released next Friday? I can answer that one. It's because the soundtrack will be released digitally on November 16th. Oh, OK. I didn't notice the physical and the digital versions weren't released on the same day. I didn't notice the physical and the digital versions weren't released on the same day. Well, you know Disney. They always push for the digital version of something over the physical one. Sorry, one more question, disneyprincess11. Now that you've seen both Incredibles 2 and Ralph Breaks the Internet, which of the two do you think is more likely to win the Oscar for Best Animated Feature? So sorry it took long. I just got home after flying all day and I was unwinding for a bit. Oh dear! What a shame! I met Paul Briggs and he was so sweet, plus I won an exclusive picture from him! He said he was the director of a new movie and he was very excited and that's it. 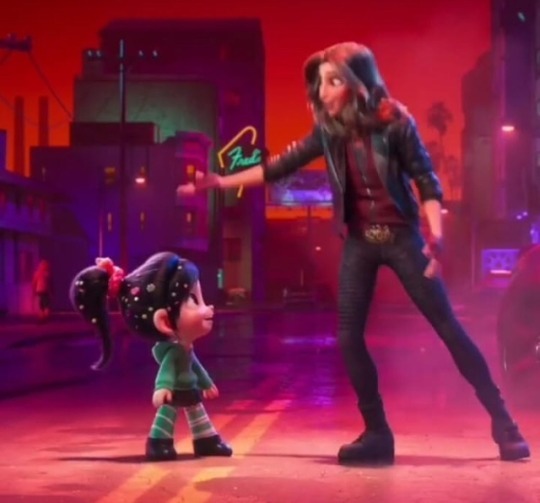 We got BTS footage after the movie, so we saw a tiny bit of the first draft of the Princess scene that had Yess with the girls, a couple of handrawn tests of Ariel, Snow and Yesss, some art for Vanellope's song, and footage of Taraji's first recording as Yesss. Basically, even if you end up not liking the Princess scene, you will like it more than the Expo scene. I personally love the Expo scene more than the final a bit more, but I still immensely enjoy the final version. The chemistry and sisterhood are still there! Sure, sure! I would be equally happy if any of those two will win. Wreck-It Ralph 2 is all about the emotions (Very deep! ), but Incredibles 2 is more sophisticated. Knowing how the Academy foolishly picked Brave over the first movie, we should all expect history repeating itself. And while we're on topic, I firmly believe "A Place Called Slaughter Race" is a strong contender for a nomination. Again, it has the huge Broadway & Disney feeling & sophistication and the Academy loves that! But, I think it'll be A Star is Born's Oscar to lose. Whatever APCSR stands a chance to be a big competition for MPR's music is too soon to tell, but it wouldn't surprise me. Thanks for your review! I'd honestly lost a lot of my interest in this film over the past few weeks, but everything you said has revived my interest. The original film is one of my favorites from the last decade and if you think that Ralph and Vanellope's characters not only weren't tarnished from this film, but emerged stronger, than I think I have nothing to worry about. I'm glad to hear that the princesses scene has been toned down as well since I really haven't been a fan of that. Please, don't worry about that. Thanks for answering my questions! I’m glad you got to fulfill the dream of visiting the studios and you even met the director of an upcoming WDAS feature! I wish I could go there one day too. Thanks for sharing all the details about your visit and about the movie. Yes, I guess Incredibles 2 is more likely to win the Oscar, but who knows, maybe they feel they owe Ralph the award given that they didn't award the first film when it was the favorite. We'll see. I don't know which one I want to win yet (if one of the two ends up getting the Oscar). I'll have to see Ralph Breaks the Internet first. It would be great if Alan was nominated again for this song. Now I'm more excited to hear it than ever. Last edited by DisneyEra on Wed Nov 14, 2018 12:27 am, edited 1 time in total. Well, I guess this is a good and apporiate time to say that Stan Lee has a funny cameo during the Disney scene in Wreck-It Ralph 2. What a great last cameo for him! No, they film the cameos in advance, so his last true cameo will be in Captain Marvel or Avengers 4. Honestly, I'm looking more forward to watching The Grinch than I am WIR2 right now. The reviews on RottenTomatoes are apparently coming tomorrow. I believe it will be mixed to positive. Wouldn’t be surprised if there are raves. There are very deep themes and emotions.